Interesting to find the dates of publication of the pages here, as most of them are from May through October of 2013. One such page, Projects In Progress mentions Google’s Page Rank for mousehelp as being “just below the fold.” Now, mousehelp and my sites with that root all dominate search results for that term. That was the point of writing this site at the outset. Now, this site is a nice reference I can share with prospects when showing them how SEO was done and is done today. 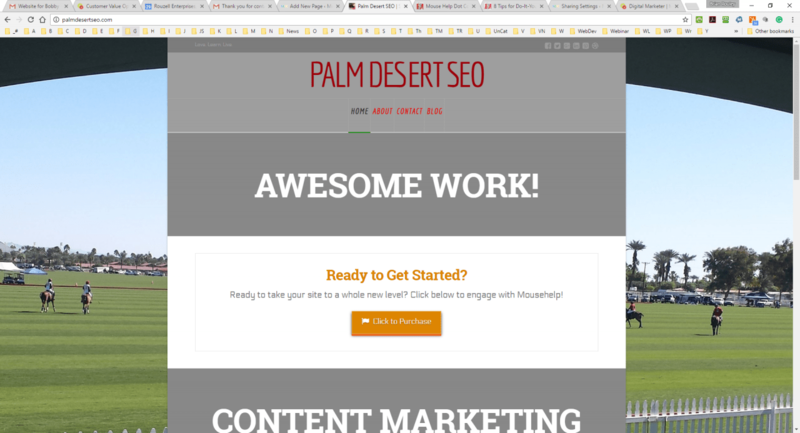 When I tell people to search for “Palm Desert SEO Expert” pretty soon, this page will show up near the top of results, along with so much of the content I’ve created through the years. One thing missing from my site today is video. I’ll add something to the pages and posts here tomorrow. For now, enjoy!